Robotic platform for the evaluation of walking robots applied to the detection of anti-personnel mines. 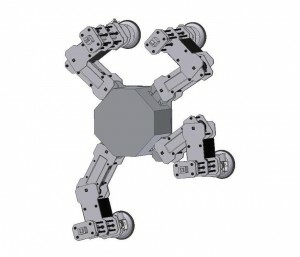 (A quadrupedal walking robot). The objective of this project was to develop the first mobile platform based on walking robots. We developed an omnidirectional quadrupedal robot that allowed the locomotion in mammal or insect mode. We develop the control hardware based on the microntrolled systems. We implemented orientation and strength virtual sensors. A MATLAB model was developed to simulate the stability of the system based on the ZMP analysis. Nowadays, the hardware of the system has been updated to use FPGA and students of the Master’s program of Control and Industrial Automation are testing advanced control algorithms in it. As future projects we have the implementation of motion planning algorithms. The objective of the ARTE (Adecuación y Restauración Teleoperada de Edificios – Teleoperated reconditioning and restoration of buildings) project was to develop innovating technology in the field of buildings reconditioning to rescue the cultural patrimony of the city. A climbing walking robot capable of cleaning and reconditioning the walls and windows of the buildings was the result. We designed control algorithms and displacement modes in a real time operating system (QNX). We implemented vacuum virtual sensors. We develop the control hardware based on the microntrolled systems. This project was focused in the development of a mobile platform for places on fire to support the firefighters of Cuenca, Ecuador. A student multidisciplinary group work was established with electronic and mechanical engineering students for the design and construction of the robot. We implemented autonomous navigation and teleoperation systems. The mechanical system of the robot could bear high temperatures, keeping the internal temperature of the control systems controlled. We used the openCV library for the development of 2D and 3D computer vision systems and Arduino as hardware platform. 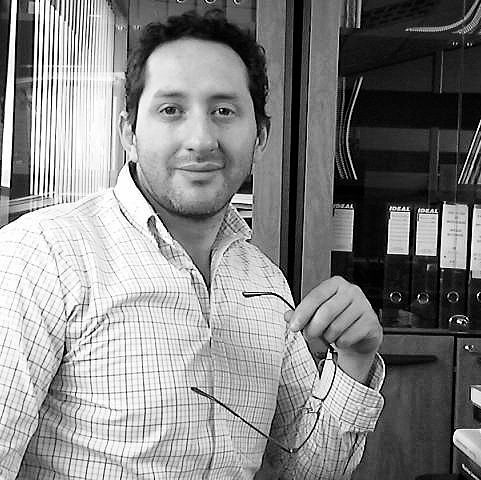 Undergraduate students: Adrian Arpi, Sebastián Argudo. The objective of this project was to develop a mobile platform of scalable open source architecture for the evaluation of cooperative robotics algorithms. We developed a low-cost mini-robot and implemented a real time operating system and algorithms for the remote programming of the robot. Among its innovations were the use of the stator of the motors as its incremental encoder of position, which reduced the cost and size of the robot. Its scalable architecture allowed the development of free source hardware..
Undergraduate students: Nelson Cárdenas, Galo Simbaña.